This ultimate Uyuni Salt Flat 1-day tour is perfect for those who are short on time, yet still want to see this bucket-list item in Bolivia, South America! This tour allows you to visit the vast natural wonder of this epic destination, whilst still allowing plenty of time to take lots of fun and memorable photos! Uyuni Salt Flat 1-day Tour - Unforgettable Bolivian landscape. Hear the stories of the cool old trains at the Train Cemetery. Visit one of the first Hotels made of salt! The little settlement village of Colchani - known for Salt extraction. Finally see the beautiful eye-blinding salt flats – don’t forget your sunglasses! Most cost effective way to see the amazing salt flats. 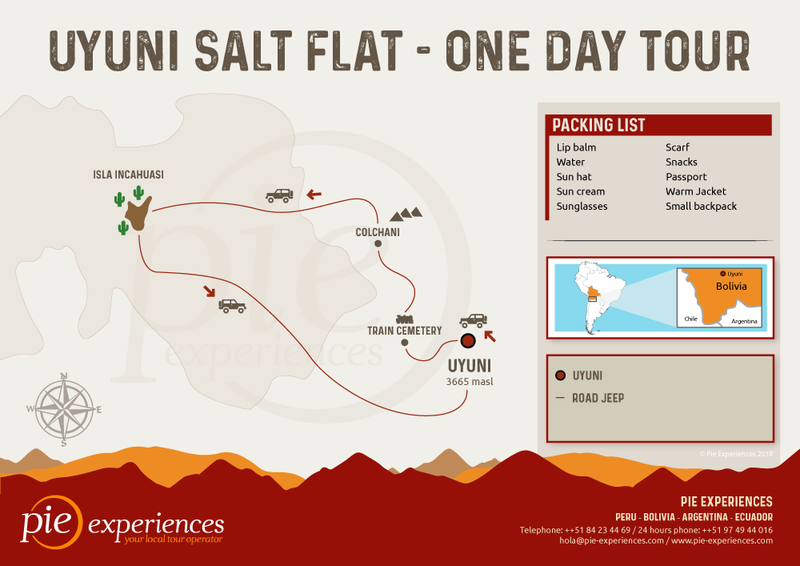 Day 1 | Uyuni Salt Flat 1-Day Tour – Spectacular Scenery and Unforgettable Memories! The Uyuni Salt Flat 1-day tour starts with a visit to Uyuni’s eerie ‘Train Graveyard’ where you will learn about the first locomotives in Bolivia. On our way to Salar, we stop to visit the small old mining town of Colchani. You will hear stories about those who worked in the salt miners workshops and you will also find handicrafts made of salt. Take photos as we cruise along the vast white expanse of salt and visit los Ojos de Agua Salada (‘’salt water eyes”). Next up is the main attraction – The Uyuni Salt Flats! Immerse yourself in the spectacular natural beauty of one of biggest salt flats on earth! There will be plenty of time to take lots off fun, perspective photos. See how creative you can get! Don’t forget to pack your sunscreen as the sun can be quite harsh reflecting off all that white! Next up, you will be served a most memorable group lunch on the salt flats. Following this, we will visit ‘Incahuasi Island’ (Fish Island). From here, you’ll see the giant cactus, and the rock formations made of petrified coral. We will also visit a Hotel made completely out of salt, which is now a Museum and well worth a look. As the sun sets, our tour ends and we head back to Uyuni. Entrance to Incahuasi 50 Bolivianos. This Uyuni day tour leaves after breakfast in comfortable 4x4 Toyota land cruisers. Here your guide will introduce everyone and then get you all ready for the day’s adventure! Afterwards, you will visit the small settlement village of Colchani, where you will see the salt miners’ workshop next to the salt flats. Hear stories of the old salt refinery and about the traditional method of table salt production. Here you will learn how they extract, refine and package the salt. You will also see handicrafts made of salt and textiles made of llama and alpaca. Following this, we will have a lovely group lunch prepared for us right on the salt flats! A truly unique experience. There will be plenty of time to take lots of photos. Especially the iconic proportionally-distorted ones! Have a play with the vast perspective and depth perception. You’ll have lots of fun coming up with cool ideas! Next up, you will go to the central point of the salt flat, Incahuasi Island (Fish Island). Here we will have time to walk to the top of the island to the see the incredible view of giant cactus and rock formations made of petrified coral. As the sun sets, this marks the end of a fabulous day together, and we return you to Uyuni town. We say goodbye to our new friends and remark on an unbelievable day!